We carry a full line of low cost coil binding and comb binding machines and supplies for creating attractive presentations and books. We offer Electric and Manual Binding Machines, Spiral Coils, Plastic Binding Combs, Binding Punches, Coil & Comb Inserters and Finishers. Check out our full line of binding covers from clear plastic to luxury leather covers for professional presentations. 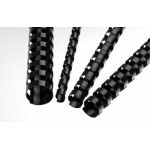 Get all your binding supplies at Buy Lamination. 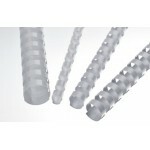 We offer low cost plastic binding combs and spiral coils for use in most electric or manual binding machines. 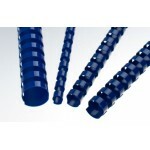 Plastic Binding Coils are 12 inches long plastic spirals that are twisted through the punched materials and crimped on the end to hold materials together. Plastic Binding Combs are plastic tubes with fingers (combs) that are inserted into rectangular punched holes in material to be bound. Binding Coil Length: 12" long Binding Coil Pitch: 4:1 Binding Coil Color: White (Also available in black, clear and navy). Binding Coil Sizes: Ranging from 6MM to 32MM, holding 30 to 280 sheets of paper. Binding Coil Length: 12" long Binding Coil Pitch: 4:1 Binding Coil Color: Clear (Also available in white, clear and navy). Binding Coil Sizes: Ranging from 6MM to 32MM, holding 30 to 280 sheets of paper. 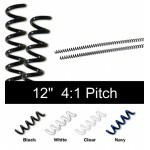 Binding Coil Length: 12" long Binding Coil Pitch: 4:1 Binding Coil Color: Navy (Also available in white, clear and black). Binding Coil Sizes: Ranging from 6MM to 32MM, holding 30 to 280 sheets of paper.